Worst winter ever? The second blizzard in less than a week buried the most populous stretch of the East Coast under nearly a foot of snow Wednesday, breaking records for the snowiest winter and demoralizing millions of people still trying to dig out from the previous storm. In D.C., 10 fresh inches of snow erased what little progress plows had made removing the 24 that fell last weekend, reports CBS News correspondent Nancy Cordes. Conditions in the nation's capital were so bad that even plows were advised to get off the roads, and forecasters were eyeing a third storm that could be brewing for next week. "I've seen enough," said Bill Daly, 57, as gusts of wind and snow lashed his face in Arlington, Va., where streets were nearly empty just a few days after people had been playing in the snow. "It's scary and beautiful at the same time. I wanted to shovel but thought if I had a heart attack it could be a while before anybody found me in this kind of weather." It's been a stormy winter for the Mid-Atlantic, reports Early Show weather anchor Dave Price. There's no single reason but a major influence has been a cooler Pacific Ocean. That's pushing cold air from Canada deep into the United States. Storms are tracking along the jet stream toward the Mid-Atlantic states rather than along the Eastern seaboard. The pattern could stick around for years, Price said. Old-timers talk about a storm that blew through Washington in 1922, collapsing the roof on the Knickerbocker theater and killing more than 90 people. Their great-great-grandchildren will be able to describe the back-to-back blizzards of 2010, which were not nearly as deadly but set records for the snowiest winters ever in Washington, Baltimore and Philadelphia. Up to 16 inches fell in parts of western Maryland. Reagan National Airport outside Washington had nearly 10 inches by 2 p.m., and Baltimore got nearly a foot. That was on top of totals up to 3 feet in some places from the weekend storm. "I have never in my lifetime seen or heard anything quite like this," said D.C. Fire Chief Dennis L. Rubin, who was born and raised in the District. The previous records for snowiest winters were 62.5 inches in Baltimore in 1995-96; 54.4 inches in Washington in 1898-99; and 65.5 inches in Philadelphia in 1995-96. On Wednesday, Baltimore had 72.3 inches so far this winter, the Washington area had 54.9 inches and Philadelphia had 70.3 inches. 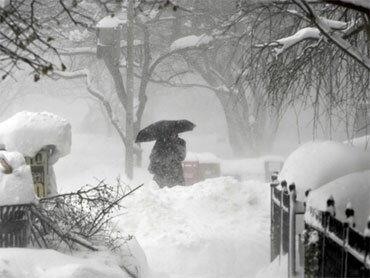 Heavy snow also fell in New York and New Jersey. Airlines canceled hundreds of flights, and New York City's 1.1 million schoolchildren enjoyed only their third snow day in six years. The Washington area's two airports had no flights coming or going Wednesday. The streets of downtown Philadelphia were nearly vacant as people heeded the mayor's advice to stay home. Entrance ramps to closed highways were blockaded, and the Pennsylvania National Guard had Humvees stocked with food and blankets ready to help anyone who got stuck. Earlier in the day, about 25 vehicles were involved in two separate pileups on snowy Interstate 80 in central Pennsylvania. One man was killed and 18 people injured. "For your safety, do not drive," Gov. Ed Rendell said. "You will risk your life and, potentially, the lives of others if you get stuck on highways or any road." Two other people were killed when their snowmobile struck a moving vehicle at an intersection in Lancaster, Pa. Michigan authorities said the storm contributed to at least four traffic deaths there. In Virginia, where some areas had snow totals exceeding 30 inches from the two storms, winds were howling at 50 mph and temperatures were plunging. Gov. Bob McDonnell urged people to stay indoors. "This snow reminds me of when I was driving tractor-trailers in Saudi Arabia, and the sandstorm starts and you can't see the roads," said Syeed Zada, 55, a plow driver for the Virginia Department of Transportation. More than 100,000 utility customers in Pennsylvania were without power. Some never got it back after the last storm. Glenn Harvey, 59, who has a lung problem and needs oxygen, had been staying at a Red Cross shelter in Bentleyville, Pa., since Saturday. Firefighters brought him there after the storm knocked out power to his house Friday night. His wife stayed home with their dog, where she's using a kerosene heater to keep warm. "It's not been easy on her," Harvey said. In Washington, officials announced that federal agencies would stay closed for a fourth straight day Thursday. The longest weather-related government shutdown ever was in 1996, when employees did not have to go to work for a full week. A Caribou Coffee shop in the capital was standing room only. Most people pecked away at laptop computers as snow fell steadily outside. "Can't get to the office, but the work still needs to get done," said attorney Christopher Erckert. Driving conditions got so bad that officials in Washington and some nearby suburbs pulled plows off the roads. In Baltimore, Pete Korfiatis dumped snow into the Inner Harbor with a front-end loader until city officials decided the roads were too slick. "They just shut everything down," he said. Heavy snow collapsed part of the roof and a wall at a Smithsonian Institution storage building in Suitland, Md. It was not clear if any artifacts were damaged. The District of Columbia's representative in Congress asked the White House to declare a federal emergency to help the capital recover. In New York, George and Natividad Sanchez trudged over slushy sidewalks in boots, parkas and scarves to take their 2-year-old daughter to see "Sesame Street Live: When Elmo Grows Up." "I didn't want to disappoint her," George Sanchez said as the family arrived for the show at a theater in Madison Square Garden. The news wasn't all bad. Washington has not had a homicide in a week. Ski areas were doing brisk business, when people could get to them. And private contractors were making money plowing driveways and parking lots. But many people were just ready for the ordeal to end. In a yard in Westmont, N.J., someone used bright orange paint to scrawl nature a message on a white backdrop: "Dear Mr Frost," it read. "We're good w/ snow."